Math Learning Software for Schools and Self-Study | Math Tutor Inc.
adaptive mathematics instructional programs for high school and middle school. will also find the series to be ideal. Schools, families, and individuals alike have found the Math Tutor series to offer the best math educational teaching software available anywhere. The series is also effective for remedial and developmental math instruction. will help students master the concepts of pre-algebra and build proficiency in problem solving. It will give students outstanding preparation for the math courses to come. Each of the subjects that follow pre-algebra - algebra 1, geometry, algebra 2, trigonometry, and calculus - is given outstanding, comprehensive treatment by other programs in the series. For example, Algebra 1 in the "Concepts and Skills Series" will help students learn the concepts of elementary algebra, and basic problem solving. Algebra 1 in the "Practice and Review Series" will help students build mastery in solving problems of intermediate and advanced difficulty. The Math Tutor series features self-paced lessons suitable for students at all levels of ability. The series helps students achieve a deep understanding of key math concepts and gain the confidence so critical for success in math. Additional titles in the Math Tutor series include SAT/ACT Math, and Learning Business Math. "Students are enraptured by the graphics and animation! The tutorials are outstanding in explaining concepts that students often struggle with." "Our son was failing algebra, and we had almost given up hope. Your software program made all the difference. Now math is his favorite subject!" "The use of animation is especially effective in conveying the concepts and operations of mathematics." 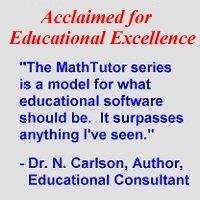 "The MathTutor series is the best educational investment we have ever made. We are homeschooling our children and the progress they have made is astonishing. We can't thank you enough." "This is an outstanding software series that students at all levels can use to improve their math skills." "Our daughter's teacher recommended your series and we're so glad he did. To our amazement algebra is now her favorite subject, and she takes pride in explaining math to her friends." "The MathTutor series has been remarkably effective in helping students develop problem-solving skills." "Our Math Lab has a variety of software packages. None have been more effective than the MathTutor series in building math skills. Your software is outstanding." "Students at all levels benefit from the wide range of problem solving exercises, and the diagnostic evaluations of their performance." "We bought the MathTutor series after reading a review and we are thrilled. Our son's math grade has gone from a C- to an A, and his confidence has soared. We are deeply grateful for your wonderful software." "Your series embodies the best in educational software. It is a remarkable resource for math educators!" Outstanding curriculum-based series designed by math educators. Ideal both as a supplement to classroom instruction, and for self-study. Customers who download the titles they purchase will receive one or more additional titles free. Please see "Order" page for more information. 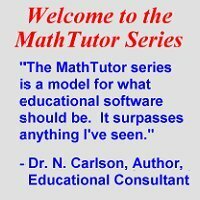 We are pleased to provide a free title from the MathTutor Software Series for your personal use. You will be able to download the program from our website. These programs are designed for use on Windows PCs. In the list below please click the title you would like to download. Then check the checkbox to confirm that the program will be used for personal study. After you click SUBMIT the download instructions will be displayed. I am a student at the school or organization above. I will be using the software for personal study, and will not sell or otherwise distribute the software.